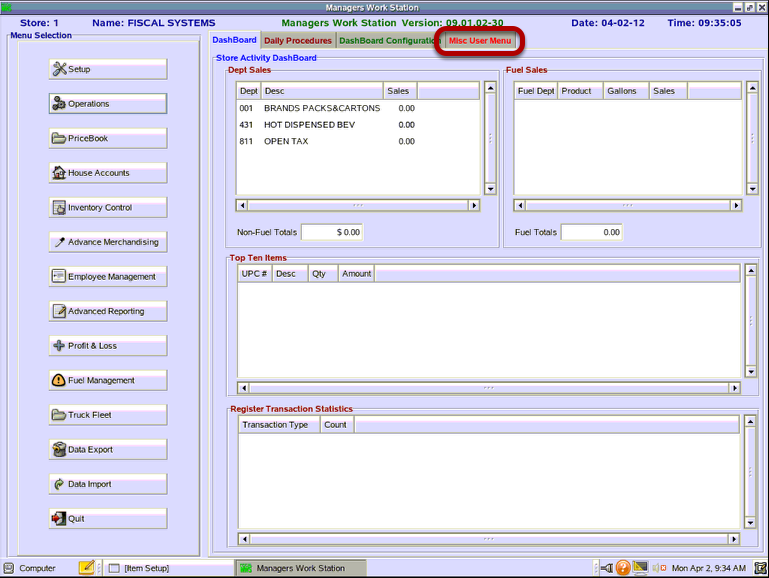 TravStar1 Point Of Sale SystemManager's Work Station Additional SetupHow Do I Create a Menu File? How Do I Create a Menu File? This lesson will teach you how to create and edit a pop up menu file that can be used at the register. A button can be created to access this file at the register to allow you to choose from a list of PLU's rather than assigned each PLU to an individual button. This saves time at the register and space on your register screen. From the Main Menu, click on the "Misc User Menu" tab. 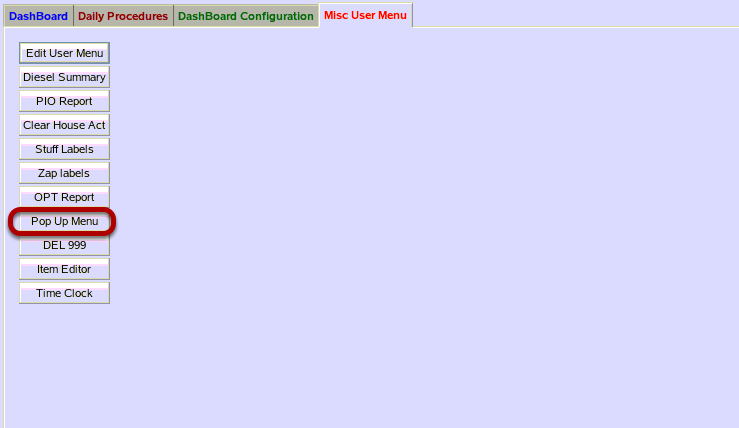 From the Misc User Menu, click on the "Pop Up Menu" button. 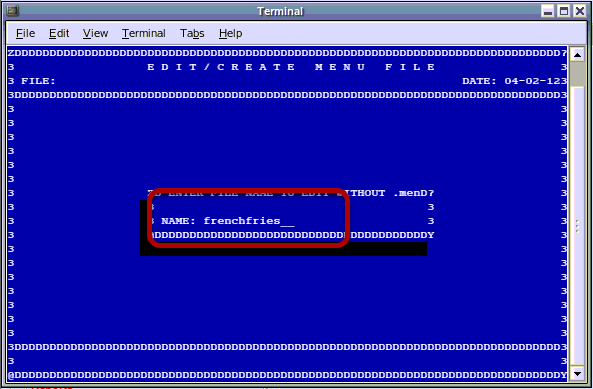 In the terminal window, type in the name of the menu file you wish to create. 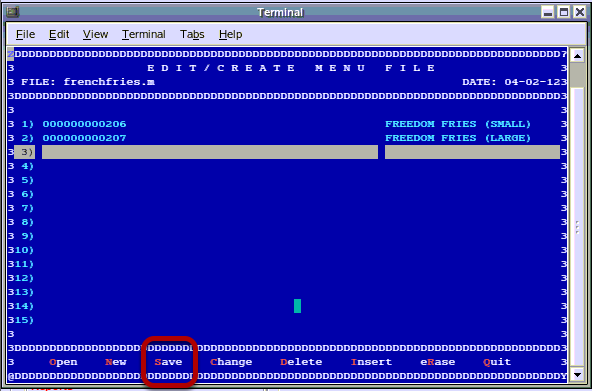 This is the name of the file that will be assigned to the button at the register. All menu files have a .men extensions. For example: chicken.men, colddrinks.men, deli.men. 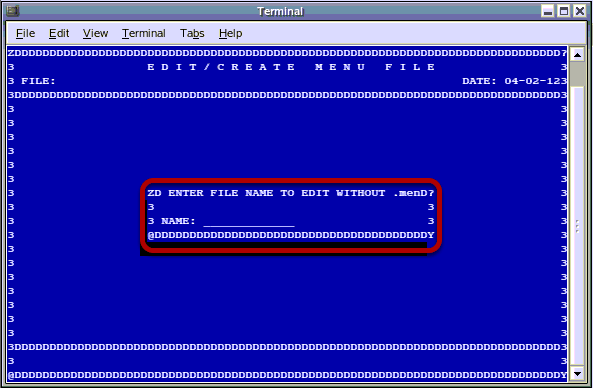 Note that when you enter the file name on this screen it tells you "Enter File Name to Edit Without .men." 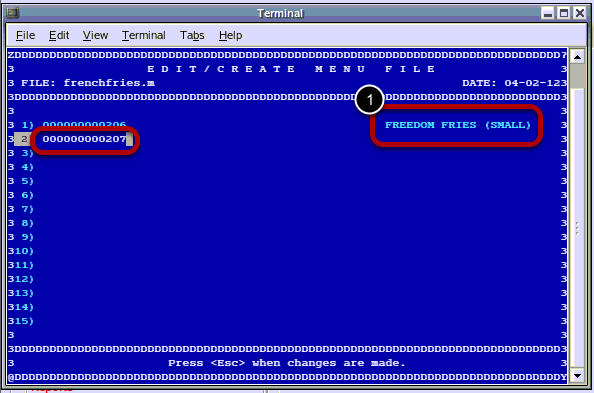 In the example above, the name of our menu file is frenchfries. When you have typed in the name, press enter on your computer keyboard. Answer Y to File Not Found! Create? In the Edit/Create Menu File screen, press the C key on your computer keyboard for "Change". Type in the PLU number you wish to add to the list. 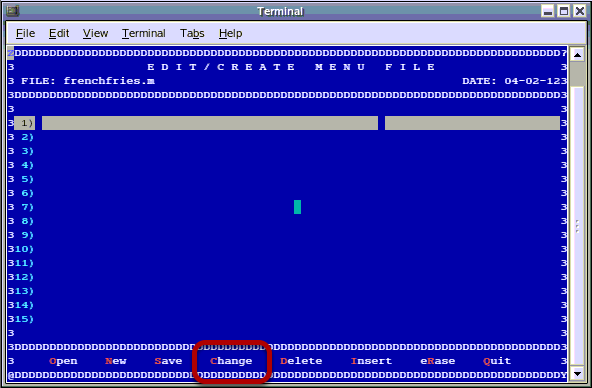 1) If you have typed the name correctly, you should see the name of the item you have entered appear to the right. 2) Type in the PLU Number for the next item in your list. Press the Enter key on your keyboard. When you have completed adding items to your list, press the Esc key on your keyboard. Press the s key on your keyboard for Save. Use your up and down arrows on your keyboard to move between lines. 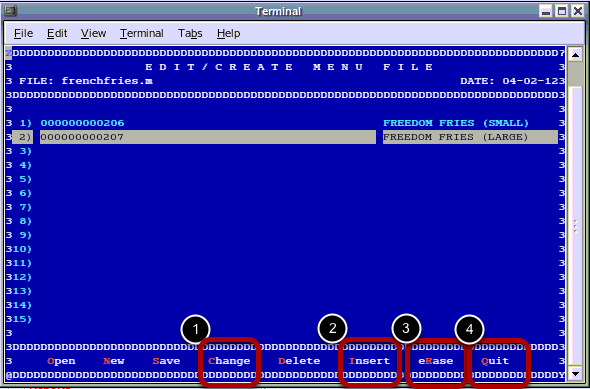 1) To go back and change information in a line, highlight the line and press C on your keyboard for Change. 2) To add a new line press I for Insert. 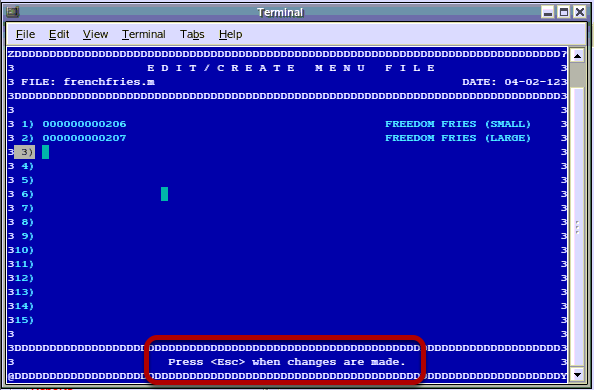 3) To erase a line, hightlight the line and press the R button on your keyboard for eRase. 4) Remember that you can always Quit without saving to start back from the beginning. 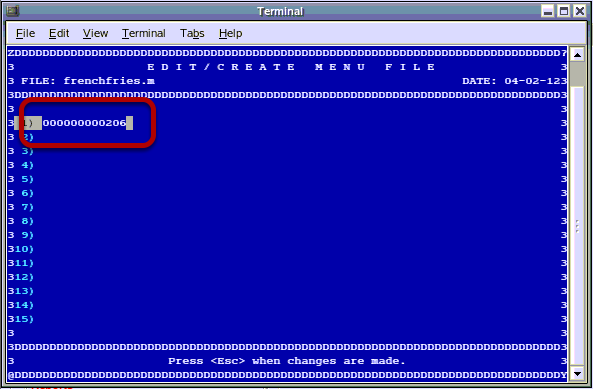 You must send the menu file you have created to the register so it can be assigned to a button. 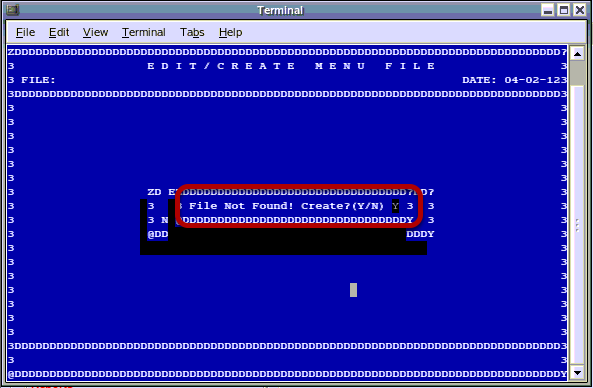 For instructions on sending the menu file to the register, see the lesson How Do I Setup And Send Commands To The Register? Prev: How Do I Setup a Percentage Discount? Next: How Do I Restart the Manager's Work Station?